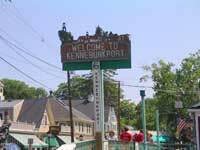 Vacationers come to the Kennebunks in all seasons because there is so much to see. Walking the historic village of Kennebunkport you witness historic sea captain’s homes and the working waterfront where ships were launched, and lobstermen have hauled their catch for centuries. You can take an architectural tour to learn more about the seaside mansions and colonial homes, or drive along the coast to see roadside clamshacks, summer cottages and lighthouse like Goat Island Light in Cape Porpoise. Ocean Avenue is Blowing Cave and Spouting Rock are must “sea”, part of the seaside walk called Parsons Way. This scenic seaside path also takes you by President Bush’s so called “summer White House,” the family compound of George H.W. Bush and the Bush family on spectacular Walkers Point. Summer Street is famous for its magnificent homes that are so historic and beautifully landscaped, some are rumored to be haunted. The Wedding Cake House is one of the most photographed homes in Maine, so you must see this architecturally unique home in Kennebunk. 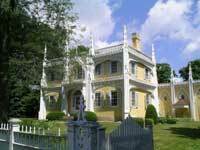 The Brick Store Museum in downtown Kennebunk Maine Street offers guided tours of the famous town and the historic homes. Goat Island Lighthouse– Built in 1834. Viewed from Cape Porpoise Pier. Kennebunkport Conservation Trust manages the island light property and orangizes tours, even overnights in the lighthouse. Trolley Tours of the Kennebunks – Intown Trolley – in season narrated rides from town stops, see signs in Dock Square, Ocean Ave and Kennebunk Beach. 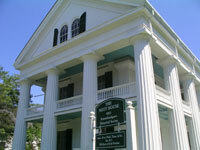 Kennebunkport Historical Society – home to an old school house and historic exhibits, also includes nearby sight – White Columns – aka Nott House – Kennebunkport’s Bush Family Legacy Museum – in the Greek Revival House near Dock Square, 135 North St, Kennebunkport, 207-967-2751. Franciscan Monastery – a 65 acre property of Lithuanian order monks, beautiful grounds with religious grottos, scenic walking paths to the Kennebunk River open to the public, church services, and host of the annual Christmas Prelude Candlelight Caroling. Rachel Carson Wildlife Preserve – Open sunrise to sunset for bird watching and self-guided tours. Rt 9 Kennebunk/Wells Town line. 207-646-1555. Scenic Walk – Marginal Way – Ogunquit one mile path along coast. Ends in Perkins Cove. Scarborough Marsh Nature Center – Maine’s largest salt marsh is best explored by canoe. Guided and self guided canoe tours. Abundant shorebird sightings. Nature center offers slide shows, exhibits. Rt. 9, Scarborough. 207-883-5100.